If you are walking around the city you can see a lot happen around you. And while you might just put your wallet away and enjoy some strawberry ice cream, you see the photo you were waiting for all day. But as quick as the opportunity arises , so fast she will be over – because one has only one free hand. 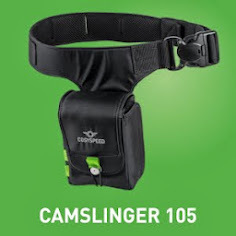 The Camslinger 105 provides quick , one-handed access to your compact system camera. The camera bag hangs on hand at your hip , like a holster. And almost as fast as a Colt from the holster you can also get the camera out of the bag. It fits rigth inside it and slides in and out easily thanks to the internal padding. So the camera is ready to use in the blink of an eye. Due to the small dimensions of the bag it is as discreet as the Compact System Cameras itself. It's also possible to easily move the Camslinger bag forwards and backwards around your hip which increases the comfort and freedom of movement. In the beer garden you can sit down to drink, for example, a small water without putting the bag aside. It is possible to pull of a short sprint to change the point of view. You can always be ready to use your camera in the crowded subway, during rummaging at the flea market or at the BBQ at the river. In all of these cases the bag does not disturb you and hangs almost unnoticed on the belt. In addition to that the fastening gives me a sense of security. The combination of the safety button and rubber band is amazingly practical and fast. The bag can be perfectly opened and closed from the top. All in all, the Camslinger 105 is the ideal companion for photo walks around the city with very little equipment for me. It gives me the feeling of being always ready for the next photographic challenge. Superman always needed a phone booth nearby to be ready for his heroic deeds. With the Camslinger the next heroic feat is just a 125stel seconds away.